Sylvia Pankhurst (1882-1960) was a socialist feminist who during the campaign for women’s suffrage at the turn of the 20th century, not only braved the horrors of hunger striking and forcible feeding, but also founded and built a remarkable women’s organisation in the East End of London. This group, the East London Federation of Suffragettes, was composed of working class women who campaigned for the vote and for social change in the period 1912-1920. Their weekly paper The Women’s Dreadnought (later, The Worker’s Dreadnought), owned and edited by Sylvia, had an enviably high circulation and was infuential outside London. 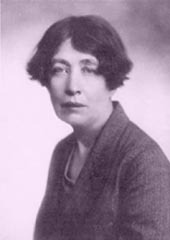 Sylvia’s strategy, which linked class and gender, did nt find favour with the most famous of the suffragette organisations, the Women’s Social and Political Union (WSPU), to which she belonged and to which the East London Federation was affiliated. The WSPU (popularly known as the Suffragettes) was founded in 1903 and led by Emmeline and Christabel Pankhurst, Sylvia’s mother and older sister respectively. Sylvia was expelled by them from the WSPU in 1914. The WSPU abandoned its early links with the labour movement in 1907 and in 1914, with the outbreak of World War One, it abandoned the suffrage campaign itself. Emmeline and Christabel Pankhurst ardently supported the war effort and urged all women to do the same. Sylvia did not take their advice. Her organisation was one of the very few to maintain the fight for the vote (its first instalment was granted in 1918). Sylvia Pankhurst was a pioneer in other ways. Apart from the fact that during her long and active life she founded and edited four newspapers, wrote and published 22 books and pamphlets not to mention literally countless articles, she was a founder and tireless activist in a variety of women’s, labour movement and international solidarity organisations. She was a deeply committed anti-racist and anti-fascist and involved for over 30 years in campaigning on such issues which included the cause of Ethiopia - the country which became her home for the last four years of her life and in which she was buried. The independence of Ethiopia “the black man’s last citadel” was ended when it was invaded and conquered by Fascist Italy in 1935. Sylvia, almost alone among the white left, rallied to its cause and launched in 1936 the first edition of the “New Times and Ethiopia News”, a weekly paper which remained in circulation for 20 years and which, at its height sold 40,000 copies weekly. This included an extensive circulation throughout West Africa and the West Indies. Sylvia’s relentless campaign for the restoration of Ethiopian independence, first against the Italians and then against the British, was warmly appreciated. In 1960, aged 74, she accepted an invitation issued by the Ethiopian government, to live there. She was an honoured guest. When she died in Ethiopia in 1960 at the age of 78, she was given a state funeral. We believe that Sylvia’s strategy, based as it was on an alliance between class and gender, did far more to win the vote for all women than the more elitist and ultimately diversionary politics of her mother and elder sister. It is thus richly ironic that the British State has chosen to honour Emmeline and Christabel Pankhurst’s contribution to women’s suffrage, with a statue for the former and a plaque for the latter, both outside Parliament, whilst ignoring the role of Sylvia Pankhurst. Sylvia would not have liked a memorial, but as a symbol of the unsung heroism of thousands of working class women who fought for the franchise and for socialism, some kind of recognition in the form of a statue of Sylvia Pankhurst is not only long overdue, but would, at long last, help correct the historical record.